Artist McKenzie known as "Hollywood Charity Artist" to the Stars! Hand-embellished Limited Edition Canvas Giclee: Artist McKenzie hand paints the art with organic paints, inks, and proprietary mediums. Each piece is signed and gallery wrapped with Heavy Duty US made 1.5" stretcher bars, Mirrored Edges, and comes ready to hang. Materials: Organic paints and inks, Water solvent non-toxic UV protection on Canvas. Definition Gallery Wrapped: Gallery wrapped means that the canvas is only stapled on the rear of the stretcher bars where they do not show. The sides of the painting have no staples giving it that "gallery quality" look and making it possible, and preferrable in most cases, to hang the painting with no frame. This allows you to hang your painting and still be able to see the beautiful mirrored edges. Definition Mirrored Edges: Mirrored edges in a Gallery Wrapped painting "mirror" the painting as the canvas folds around the edge of the stretcher bars. In the case of McKenzie's paintings these are 1.5" mirrored edges that give the painting a real 3D look and makes it ideal to hang without a frame. Definition Giclee: (pronounced Ghee-clay) is a French word that means a spray of liquid. It is a Highly specialized printing method typically used by galleries to reproduce fine art pieces. A special printer sprays millions of microscopically small drops of archival inks to create art. Giclee printing produces the highest quality print and is the most accurate to the original that is available today. Every print results in an eloquent piece of art suitable for displaying in even the most prestigious of museums or art galleries in the world. Exquisitely detailed giclee prints on canvas are archival for 150 years. Giclee prints retain their value. This is evident through the high prices achieved at art auctions. For example, a giclee print by Wolfgang Tillmans sold for US $22,800 at Phillips auction house in New York in April 2004. The rarity of our editions, (1-300 copies), increases the value of your investment. Each image is prepared for print from the original painting. Regardless of size or substrates used each image has a fixed, limited edition. If you purchase an image with an edition of 100, you know that it is one of only 100 copies to ever be created. 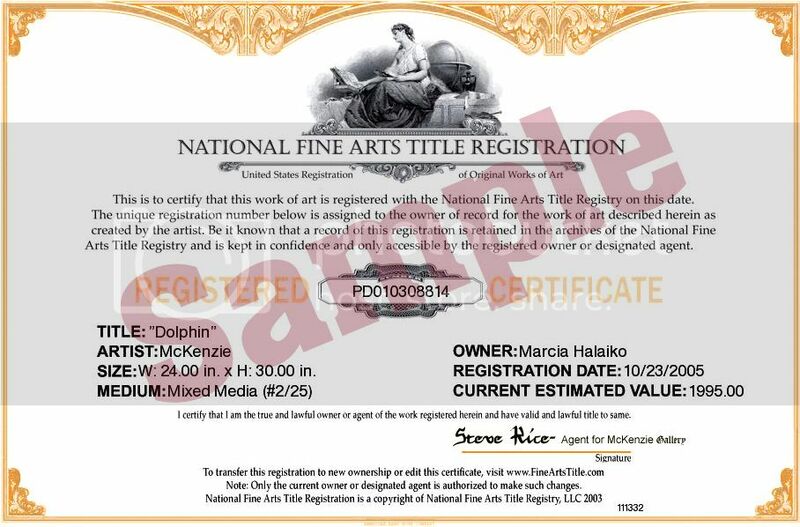 All Art is Registered at the National Fine Arts Title Registry and comes with a Certificate of Authenticity. The title will transfer to the new owner for FREE! Click the button below to add the Koi Over Rocks by Artist McKenzie to your wish list.